Home » Belize Travel Blog » Belize City » Scenic Belize City…YES! It’s There. Most tourists that come to Belize tend to spend as little time as possible in the Belize’s largest city. But Belize City is not just stinky canals and dodgy streets (though it definitely has both those things), there is history, colonial homes, museums, school kids, good restaurants and bars, shopping and much more. Belize City is definitely a bit scary (particularly at night) but there is always something going on. I promise, you will not be bored. I’d always visited in the past to just do some shopping…quickly in and out…but I wanted to see a different side of the city. Belize City is very close to San Pedro…just a 15 minute flight or, even cheaper, an hour and 15 minute water taxi ride. Both are very scenic. Take the flight for a beautiful view of the cayes…you can actually spot manatees in the water sometimes. Or take the boat for a cool entry into the Belize harbor. When I pulled in the lobster fishermens’ boats were all lined up. Some dropping off their catch at the co-op or picking up ice, some just doing laundry on their boats. I couldn’t take enough pictures. (I honestly took 64 pictures of just these boats). These pictures are taken from the Swing Bridge. Did you know that it is the only functioning manually operated swing bridge in the world? First? Let’s hit the Museum of Belize. I didn’t even know we had one. And it’s housed in the old prison right in front of the Central Bank. Belize has a pretty cool history. We saw lots of the usual museum stuff…old money, stamps (from 1837 – Queen Victoria to now) and some really cool pictures and memorabilia about Belize’s history. Like most places, Belize City has a history with plenty of disasters. The un-named hurricane of 1931 which killed over 3000 people, Hurricane Hattie that almost wiped out Belize City and countless fires that at times destroyed most of the city. The prison was built in 1857 and just closed as a jail in the late 1990s. Here is my favorite of all the stamps…Prince Andrew and his ex, Fergie. Did you know Mohammad Ali visited Belize in 1965 and did an exhibition at the Palace Theatre (demolished in 1989)? How cool is that? Or that this Belizean flag was found in the rubble of the World Trade Center and presented by a NYPD officer to the Belizean Mission in NY? It got me a little choked up. Here is an actual prison door…that little hole was the only light or air. That would definitely scare me straight. 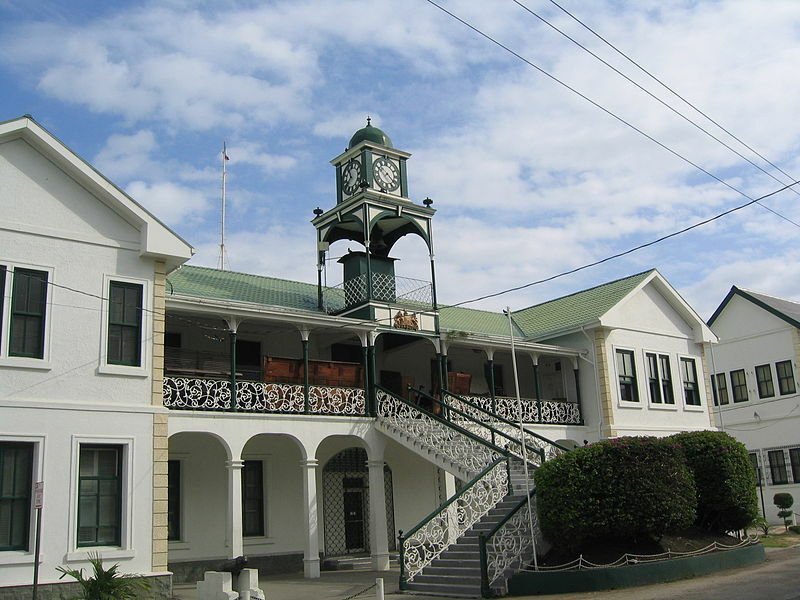 Off to the House of Culture next…a BEAUTIFUL colonial house right on the water. If I were ever to wed (god forbid), this would be the place. It’s very “Gone with the Wind” looking over the sea. This house was the seat of the colonial government from 1814. It’s very easy to picture the Brits sipping gin and tonics on the back porch or dancing in the mahongany ball room on the second floor. On Sept 21, 1981, the British flag was lowered and the Belize flag officially raised for the first time on this house’s front lawn. There is not a TON to see…an exhibit on the history of Lotto in Belize and one on slavery but it’s definitely a cool place to visit. Did you know that in the early 1800s, slaves made up 75% of the Belize population? Right across the street is St. John’s Cathedral, the oldest Anglican church in Central America. It was built in 1812. And the High Court building just down the street. The town was still decked out for the September celebrations. Everything was kept up for the burial and memorial to George Price. Time for lunch. And I hear that Dits is a Belize City landmark. Neighborhood a bit shady…but definitely worth the trip. Macy’s one block over is supposed to be great also. I got a SERIOUS plate of stew chicken, rice & beans, stuffing and potato salad for cheap. Apparently I looked very hungry. I didn’t even come close to finishing this off…it’s a meal for 3 people. Tee hee…looks like I’m crying. I have a water taxi to catch…so I did a quick shopping trip at Mirab’s (the Target of Belize). They were actually setting up their giant Xmas tree. Sept 28th! These guys do a fantastic holiday display. Thanks. Got it from my lil brother for xmas last year. Very handy on the island. I always kind of liked Belize City. It reminds me of how New Orleans used to be years ago. The smell is still similar: salt air, garbage, cooking. New Orleans on the outer edge of the French Quarter is exactly what I was thinking. I mentioned that in my blog about The Great House. That area really struck a chord with me.